Alumnus donates to improve "heart of the school"
SASKATOON - Edwards School of Business alumnus Larry Moeller and his family have donated $500,000 to rejuvenate the dedicated student space in which he and his classmates studied in during the 1970s. The Moeller Resource Room was unveiled today at the University of Saskatchewan (U of S) with the extended Moeller family in attendance, to celebrate with students, faculty and staff. The Moeller donation was immediately matched by the university in order to create $1-million in extensive changes both to the Reading Room and other student spaces, honoring the Edwards School of Business’ commitment to the student experience. The former Commerce Reading Room was a heavily utilized space for students for decades, but it had become tired and shabby. 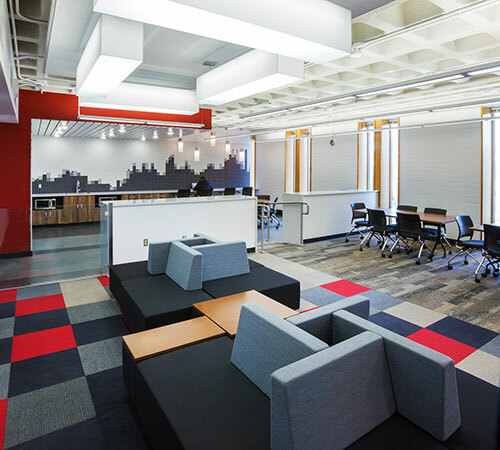 Dean Taras describes the space as “the heart of the school”, where students hit the books, play cards, socialize, and attend career fairs and networking events. Now refurbished for the future, the Moeller Resource Room has group-work tables, multi-level seating and break-out rooms for project work. There are dozens of electrical plugs to charge the students’ portable computers, complete audio-visual capabilities, and a student lounge and eating area. With the potential for catered events to take place in the space, the school looks forward to hosting numerous student competitions. Born in Humboldt and raised in Meadow Lake, Larry Moeller attended the U of S College of Commerce, graduating in 1980 to become a Chartered Professional Accountant. He and Murray Edwards, the school’s namesake, became close friends during university, and since 1994 Moeller has been working side-by-side with Edwards. Moeller is Vice President Finance of Edco Financial Holdings and sits on the board of directors for Magellan Aerospace Corporation and Imperial Metals Corporation. Moeller is an active member of the Edwards School of Business Dean’s Advisory Council, and says this gift is one of the ways he intends to stay engaged with his alma mater.